A deacon is a Christian church office generally associated with service or administration, but which varies among theological and denominational traditions. The word deacon is derived from the Greek word diakonos (διάκονος), which is often translated "servant," "minister," or "waiter." Traditionally, the office of deacon originated in the selection of seven Hellenistic Jewish Christians of Jerusalem to assist with the administrative needs of the early church, specifically the distribution of food to widows (Acts of the Apostles, chapter 6). A biblical description of the moral and other qualities required of a deacon can be found in 1 Timothy 3:8-13. Among the more prominent deacons in history are Saint Stephen, Philip the Evangelist, Saint Lawrence, and Saint Francis of Assisi. Others became powerful figures wielding significant political and financial influence as chief administrative aides to important bishops. Several popes were deacons before being elevated to the papacy. The early church had deaconesses as well as deacons. Today, in some traditions, deaconesses constitute a separate order, while in others they serve together with male deacons. Deacons had disappeared in the Roman Catholic tradition except as a temporary office held before the priesthood, but the office of permanent deacon was re-instituted in the second half of the twentieth century. In ancient traditions, the diaconate is a clerical office. In others, it is performed by the laity, and its exact functions vary by denomination. Some denominations do not have deacons. Although the seven are not here called deacons, their role as administrative aids to the Apostles serves as a model for the deacon's office in most traditions. 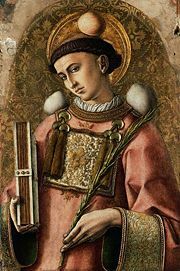 However, these seven Hellenistic Jews went on not only to serve in administrative roles, but some became effective evangelists in their own right, and one, Saint Stephen, would become the church's first martyr. Acts 8 shows that baptism was administered by the deacon Phillip, not to mention both evangelism and miracles. Paul's Letter to the Philippians refers to deacons in its salutation, and the First Epistle to Timothy gives details about the ideal character of a person serving in the office. Most contemporary biblical scholars believe 1 Timothy to be a pseudonymous work probably of the early second century rather than an authentic letter of Paul. By whatever date it was written, the letter shows that the deaconate was by then an established office in the area addressed, which was Asia Minor, specifically Ephesus. It also reveals the author's concerns that deacons had sometimes been appointed who were not worthy of the office. Among the issues he mentions are drunkenness, abuse of church funds, divorce (or possibly bigamy), and poor performance as a parent. The character of a deacon's wife was also considered necessary to consider in the appointment of a deacon. Clement of Rome (about 95 C.E.) describes the institution of deacons along with that of bishops as being the work of the Apostles themselves. Deaconesses are mentioned by the Roman official Pliny the Younger in a letter to Trajan dated c. 112. In the late second century Irenaeus speaks of Stephen as the first deacon. Eusebius (early third century) mentions that the number of deacons at Rome was limited to seven (Hist. Eccl., VI, xliii), and that a rule of the council of Neo-Caesarea (325) prescribed the same restriction for all cities, however large. Catholic tradition holds that the deacon's original duty of literally serving food to the faithful evolved into the privilege of serving the Eucharist to the faithful, but not acting as priests with regard to the transformation of the elements of the sacrifice into the body and blood of Christ. In this view, the deacons became the natural intermediaries between the priestly celebrant and the people. During church services, deacons' other roles included making public announcements, ushering, preserving order, collecting donations, and even waking sleeping listeners. Outside of the church service, they were the bishop's deputies in secular matters, especially financial affairs and the relief of the poor. They also had shared in the instruction of catechumens and preparation of the altar services. The history of the papacy shows that the deacon's office was often a powerful one, with numerous popes serving as deacons or archdeacons before being elected pope. 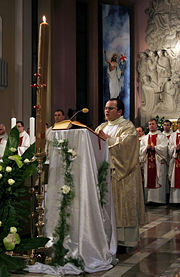 A Roman Catholic deacon proclaims the Gospel in Poland. The diaconate is one of the three ordained offices in the Roman Catholic, Anglican, Eastern Orthodox, and Oriental Orthodox churches. The other two offices are those of priest and of bishop. While the permanent diaconate was maintained from early times to the present in the Eastern churches, it gradually disappeared in the Western church during the first millennium. In the West, the diaconate continued only as a temporary step along the course to ordination to the priesthood. In the twentieth century, the permanent diaconate was restored in many Western churches, most notably in the Roman Catholic Church and the Anglican Communion. In Roman Catholic, Orthodox, and Anglican churches, deacons assist priests in their pastoral and administrative duties, but report directly to the bishop. They have a distinctive role in the liturgy, their main tasks being to proclaim the Gospel, preach and assist in the administration of the Eucharist. In the years just prior to the Second Vatican Council, the only deacons were seminarians, who received the order several months before being ordained as priests. Following the recommendations of the council, in 1967 Pope Paul VI restored the ancient practice of ordaining deacons who were not candidates for priestly ordination. These men are known as "permanent deacons." Those ordained to the diaconate who intend to proceed to priestly ordination are called transitional deacons. The permanent diaconate is particularly popular in the United States. The ministry of the deacon in the Catholic Church is described as one of service in three areas: the word, the altar, and charity. The deacon's ministry of the word includes proclaiming the Gospel at the Eucharist, preaching, and teaching. 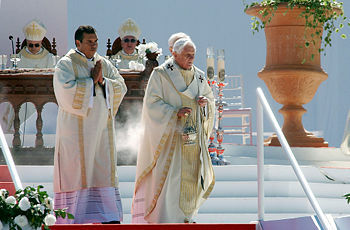 His ministry at the altar includes various parts of the Mass not reserved to the priest. The ministry of charity involves service to the poor and working with parishioners to facilitate charitable works. Deacons can administer the sacrament of baptism and serve as the church's witness at marriages. They may preside at funerals, the Liturgy of the Hours, and the Benediction of the Blessed Sacrament, and they may give blessings. They cannot give absolution, anoint the sick, or say Mass. However, they may distribute Holy Communion to the faithful. 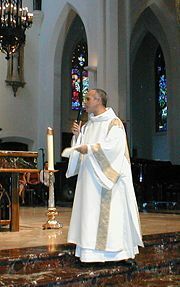 The vestment most particularly associated with the Roman Catholic deacon is the dalmatic, a long wide-sleeved tunic. Deacons, like priests and bishops, wear the stole. However, deacons place the stole over their left shoulder and it hangs across to their right side, while priests and bishops wear it around the neck. The decision as to whether deacons normally wear the Roman collar as street attire is left to the discretion of each diocesan bishop for his own diocese. Permanent deacons often maintain other full time employment. Today, more and more deacons are serving in full-time ministries in parishes, hospitals, prisons, and in diocesan positions. They may act as parish administrators. Married men may be ordained as permanent deacons. However, marriage after ordination is not permitted. Under some circumstances, permanent deacons who have been widowed can receive permission to remarry. The wife of a permanent deacon often is considered a partner in his ministry. Women themselves are not ordained to the diaconate, since they cannot receive Holy Orders. The office of deaconess existed in the West until about the sixth century and in the East until about the eleventh century. Greek Orthodox deacon in Bethlehem, wearing an orarion over his sticharion. On his head he wears the clerical kamilavka. In the Eastern tradition, in addition to reading the Gospel and assisting in the administration of Holy Communion, the deacon censes the icons and people, calls the people to prayer, leads the litanies, and has a role in the liturgical dialog of the Anaphora. However, he is not permitted to perform any sacraments on his own, except for Baptism in extremis (in danger of death), when anyone including the laity may baptize. Prior to his ordination, a deacon must be either married or a tonsured monk. Deacons may not marry after being ordained, though some bishops do allow dispensation from this rule. According to the canons of the Orthodox Church, a married deacon must be in his first marriage and his wife must be Orthodox. Diaconal vestments are the sticharion (dalmatic), the orarion (deacon's stole), and the epimanikia (cuffs). The cuffs are worn under his sticharion, not over it, as in the case of a priest or bishop. 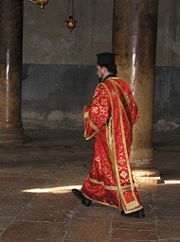 In the Greek practice, a deacon wears the "doubled-orarion," meaning the stole is passed over the left shoulder, under the right arm, and then crossed over the left shoulder. In the Slavic practice, the deacon wears a simple orarion which is only draped over the left shoulder. In the Greek practice, he also wears the clerical kamilavka (cylindrical head covering) with a rim at the top. In Slavic practice, a hierodeacon (monastic deacon) wears the simple black kamilavka of a monk, and a married deacon would not wear a kamilavka unless it is given to him by the bishop as an honorary award. As far as street clothing is concerned, the deacon wears an outer cassock with wide sleeves, in addition to the inner cassock worn by all orders of clergy. In the Slavic practice, married clergy will often wear gray, while monastic clergy wear black. In North America and Western Europe, a Roman collar is often worn, although not in the more traditional churches. Recently, the Coptic Orthodox Church has begun ordaining women deacons. In Anglican churches, deacons often work directly in ministry to the marginalized inside and outside the church. Anglican deacons are permitted to marry freely both before and after ordination, as are Anglican priests. Most deacons are preparing for priesthood, and usually remain as deacons for about a year before being ordained priests. However, there are some who remain deacons permanently. Many provinces of the Anglican Communion ordain both women and men as deacons. Anglican deacons may baptize and in some dioceses are granted licenses to solemnize matrimony, usually under the instruction of their parish priest and bishop. They commonly officiate at Benediction of the Blessed Sacrament. However, deacons are not permitted to preside at the Eucharist. Nevertheless, they may at times lead worship with the distribution of already-consecrated Communion. They may not absolve sins or pronounce a blessing in the name of the Church. 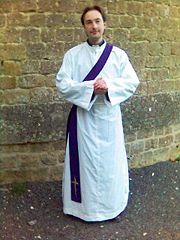 An Anglican deacon wears an identical choir dress to an Anglican priest: cassock, surplice, tippet and academic hood. However, unlike priests, deacons wear a stole over their left shoulder. A deacon might also wear a dalmatic. In the Evangelical Lutheran Church in America and Canada (ELCA) and (ELCIC), the Deaconess Community was formed in 1884. These women, who bear the title of "Sister," proclaim the gospel through ministries of mercy and servant-leadership. Since the 1970s the Sisters have been allowed to marry. Russian icon of a deaconess. The institution of female deacons died out in the Catholic and Orthodox traditions but was revived by some Protestant churches. The male diaconate was recognized by the ELCA in 1993. Lutheran deacons are referred to as diaconal ministers. Diaconal ministers are involved in preaching, assisting in worship, leading worship in lieu of an ordained pastor, and other congregational duties. They are, however, primarily called to service outside the church, in fields such as campus ministry, chaplaincy, congregational ministry, counseling, social service agency work, spiritual direction, parish and community nursing, and others. A diaconal minister is consecrated, rather than ordained. This ceremony is usually presided over by a bishop. They are allowed to wear a stole draped sideways from one shoulder and tied off at the waist. The Lutheran Church—Missouri Synod (LC-MS) has special training and certification programs for deaconesses, but not generally for deacons, who are often seminarians training to become pastors. Deaconesses assist pastors in human care ministry and other roles with the goals of caring for those in need, reaching women who prefer female leadership, and freeing pastors to focus on the ministry of the word and sacraments. Deaconesses are installed, not ordained, and remain lay women. Under most circumstances, deaconesses and deacons do not preach or administer the sacraments. Special exceptions may be made for deacons (vicars) who are training to become pastors but must be given by the District President in writing. A vicar in the LC-MS is a third year seminarian who is doing an internship under a pastor. In Methodism, deacons are ordained to word and service and to assist Elders (who are also ordained to sacrament and order) in equipping the saints for ministry. Prior to 1996, "deacon" was a term used exclusively for probationary Elders. The current ordained office of deacon has essentially taken the place of the former lay office of diaconal minister. There is also an office of deaconess for certain commissioned female missionaries affiliated with the General Board of Global Ministries. United Methodist deacons will vest much the same as Anglican deacons, wearing a stole over their left shoulder and fastened on the right side of their waist. This is usually worn over the alb or black pulpit robe. A United Methodist deacon might also wear a dalmatic, although this vestment is a relatively rare among Methodists. In the Methodist Church of Great Britain, deacons and deaconesses are created as members of a permanent order called the Methodist Diaconal Order. Deacons are also appointed or elected in other Protestant denominations. The role of deacon in these denominations varies greatly from denomination to denomination, and the existence of literally hundreds of denominations prevents a complete discussion here. In most cases, the deaconate is not seen as a step toward the clerical ministry. Often, there will be more emphasis on administrative duties than on pastoral or liturgical functions. In some denominations, deacons' duties are limited to financial management and practical aid and relief. They may also function as a board of elders or may have specific duties relating to the church service and sacraments. Some denominations do not have deacons. ↑ Deacon - The United Methodist Church. Retrieved October 7, 2007. This page was last modified on 27 July 2013, at 20:22.